Home to about 927 undergraduates in 2017, Agnes Scott is a very small, private college located in Decatur, Georgia. A safe, suburban environment can offer many of the amenities of city living without the constant hum. Should you tire of the campus however, Agnes Scott offers a "study abroad" program. Please note, some classes/degrees offered by Agnes Scott can be taken "online" so keep that in mind when reviewing this report. For more context, you might also check out our Agnes Scott Guide to Distance and Online Learning. Agnes Scott College is Affiliated With the Presbyterian Church (USA) Faith. Like many colleges with a religious affiliation, Agnes Scott is not "faith based" and is therefore unlikely to require a religious studies component. If an affinity with the Presbyterian Church (USA) faith interests you, check out our ranking of The Best Presbyterian Church (USA) Colleges and Universities. Individuals with disabilities make up 11.0% of the student population at Agnes Scott. For more information on policies and accommodations that the college provides to ensure all students get the opportunity to participate, you can visit Agnes Scott Disability Services. While not a "service academy", Agnes Scott does offer support for veterans and those seeking a career in the armed forces. Undergraduates have access to one or more ROTC programs. For more information, check out our Agnes Scott for Veterans Guide. 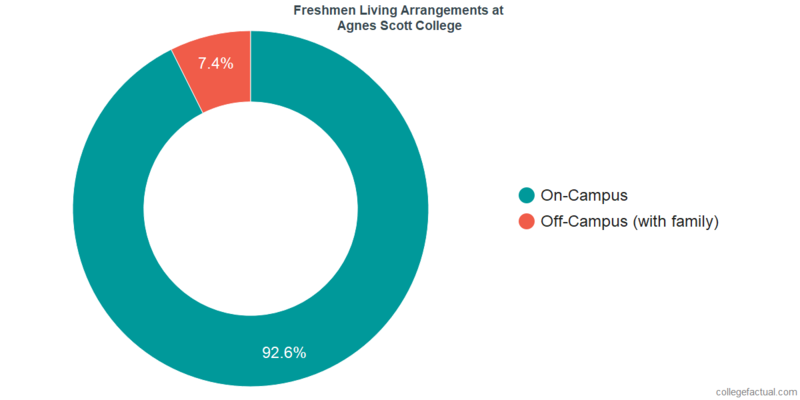 Agnes Scott offers on-campus housing, but freshmen are not required to take advantage of it. In the end though, most do choose to live in the dorms. Agnes Scott has a comparatively very small, student body. There were 927 undergraduates in 2017. Full-time attendance was 917 (98.9%). Part-time attendance was 10 (1.1%). 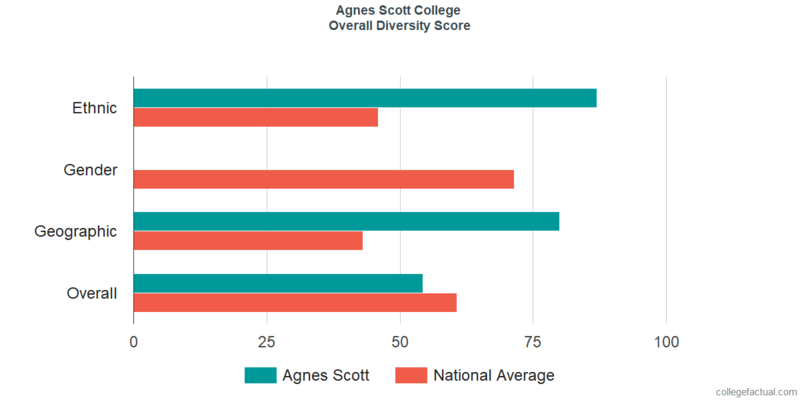 Compared to other colleges and universities across the nation, Agnes Scott is less diverse than average in terms of overall diversity. We rank Agnes Scott #1672 out of 2,238. You can learn more about the diversity of the student body at Agnes Scott by looking closer at the ethnic, gender, age, and geographic diversity metrics from the Agnes Scott Diversity Guide. We wanted to tell you about student athletes at Agnes Scott, but that information was not available.